Trying to avoid responsibility for his failure to note the killing of four US soldiers in Niger, Donald Trump lies that his predecessor Barack Obama and other Presidents did not contact the families of American troops killed in the line of duty. If you look at President Obama and other Presidents, most of them didn’t make calls. A lot of them didn’t make calls. I like to call when it’s appropriate. Obama had numerous meetings and calls with the families of slain troops, as well as writing letters to relatives. Before deploying 30,000 troops to Afghanistan, Obama traveled to Dover Air Force Base in Delaware to greet the coffins of those who had been killed. Former officials also recalled Obama’s walks through Section 60 at Arlington National Cemetery, where the dead from Iraq and Afghanistan are buried; his 23 visits to the wounded at Walter Reed National Military Medical Center; and the time he spent with families of the fallen. In August 2011, after a Chinook military helicopter was shot down over Afghanistan, killing 38 people, including 25 Special Forces troops, Mr. Obama consoled the families of all those killed, according to Jeremy B. Bash, a former chief of staff to Defense Secretary Leon E. Panetta, who attended the ceremony. Appearing in the White House Rose Garden alongside Senate Majority Leader Mitch McConnell, Trump insisted that he had written letters to the families of the four US soldiers killed in Niger, near the Mali border. He said they would be mailed later Monday or Tuesday, without explaining why they had not already been sent. A senior official said that Trump had planned to speak sooner to the families, that the White House had to wait until the Pentagon’s paperwork was completed. I don’t know if he did. I was told he didn’t often, and a lot of Presidents don’t. They write letters. President Obama, I think, probably did sometimes and maybe sometimes he didn’t. That’s what I was told. All I can do is ask my generals. Donald Trump tries to show harmony with Senate Majority Leader Mitch McConnell after months of a deteriorating relationship, but — amid the declared war by former White House chief strategist Steve Bannon against the GOP leadership — says Republican legislators are “not getting the job done”. 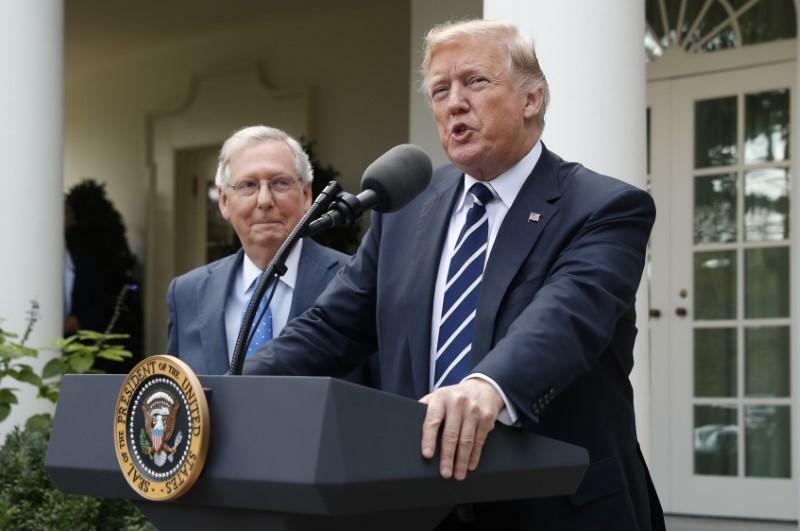 Trump and McConnell appeared in the White House Rose Garden in an impromptu 45-minute press conference, with Trump dominating the remarks. I’m not going to blame myself, to be honest. They’re not getting the job done. Trump said that he would try to talk Bannon out of at least some of the plans to field hard-right primary candidates against GOP incumbents.